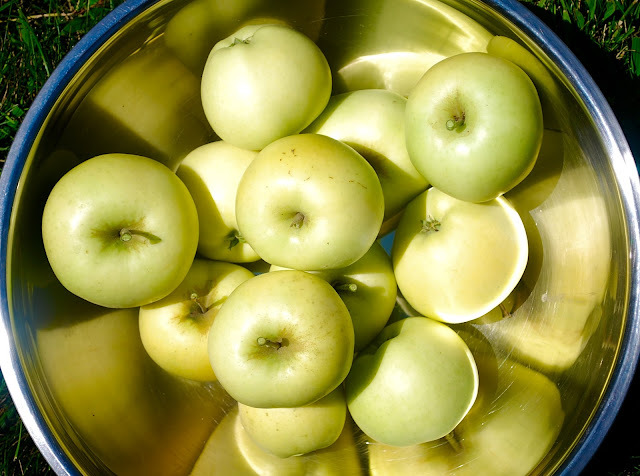 This past week, we harvested about 25 apples from our 1 year old 'Pristine' Apple tree. I started planting my home orchard last year and was really happy to get a decent first harvest this year. These apples are very crisp, sweet and surprisingly tart for an early season apple. It's pretty disease resistant as well. I highly recommend it! First year? Wow, what a great harvest. You must have such good weather and soil up there. Sigh. I've got one apple tree in the ground, supposed to be good for our area but it's been struggling. Then a new one that's another good one for our area but it's not in the ground yet of course, have to wait for Fall. And welcome back, you were missed! Very nice! They look so good! 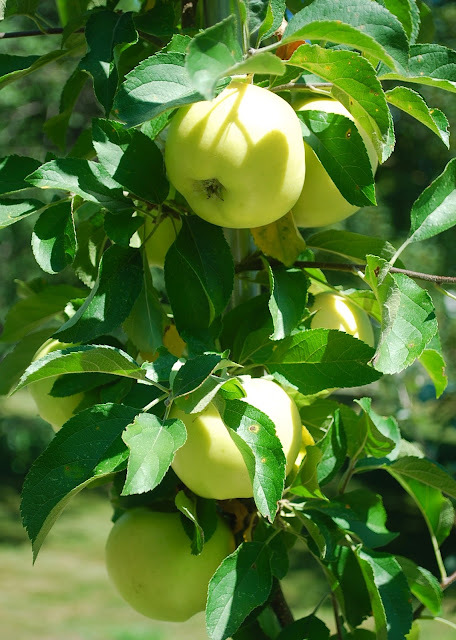 How did you get apples in your first year? For me it has always been the third year if I'm lucky. It's nice to see you posting. Hi Daphne, I grow my trees using the tall spindle growing method, which many commercial orchards are switching to. It allows you to fit a lot of trees in a small area and promotes early fruiting. I'm pretty happy with it so far. If all goes well, I'll get a crop of about 15 apples from my one year old Fuji as well. First-year apples, and such high quality. That truly is amazing. Those apples look amazing! We planted 3 apple trees this year; now you've got me all excited at the possibility of tasting some of our apples next year. I've missed your posts, Thomas! Thanks everyone. I've missed you all as well and can't wait to catch up. I feel like I've been in my own little world these pass several months. Now I'm starting to see daylight again. بعد يوم طويل من التعب والعمل الشاق يذهب الإنسان إلى بيته وملجئه الوحيد للحصول على قسط من الراحة، ولتحقيق هذه الراحة يجب عمل عدة أشغال حتى يشعر أصحاب المنزل بالأمان والسكينة، لذلك أول ما على الإنسان أن يعمله هو تجهيز المنزل وإعداده بالطرق السليمة، فالمنزل كأي جماد معرَّض للتلف مع مرور الوقت بسبب العوامل والظروف البيئية القاسية المحيطة به مثل درجة الحرارة العالية، والأمطار، والرطوبة، وأكثر ما يتعرض لتلك العوامل هو الأسطح الخارجية الحامية للمنزل من الأخطار والهلاك، وهنا يجب أخذ كافة الاحتياطات والتدابير اللازمة بخصوص الأمن والسلامة لأنّها من الضروريات والأسس الواجب تحقيقها للشعور براحة البال على المدى البعيد، وللقيام بذلك يلجأ العديد من الناس إلى طرق عزل الأسطح سنوضحها في هذا المقال.